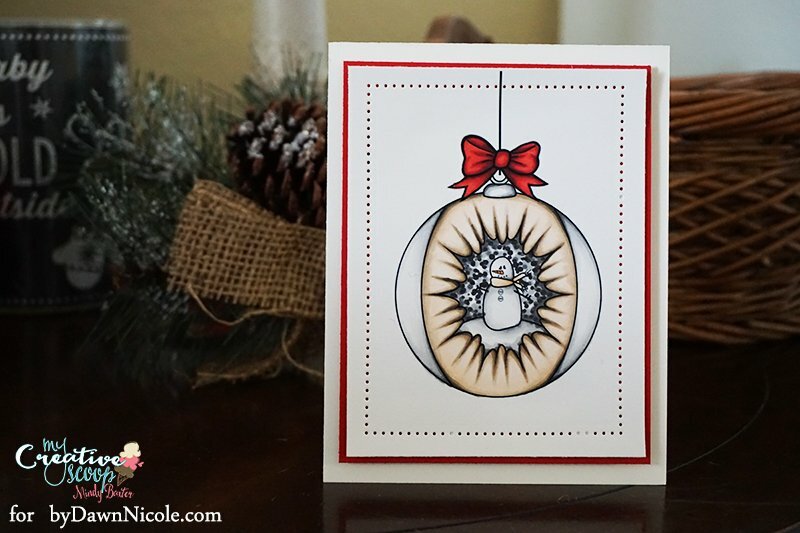 Christmas Ornament Copic Marker Tutorial + Free Printable Coloring Page Version to practice and enjoy! Hi everyone. This is Mindy from My Creative Scoop. Today I’m honored to be sharing a Copic Tutorial here on by Dawn Nicole. Step1. Start by adding N3 in the areas colored in the ‘1’ photo. Basically in the shadowed areas of the snowman, under the scarf and going down along the snowman’s body and along the snow under the snowman. Step 2. Now, you are going to take the N0 Copic and add a little more color blending out the N1 and softening up that line. Step 3. Now take N3 and darken up the areas shown in the number 3 photo. Think of it as outlining the stamped image in these areas. We don’t want a grey snowman, just adding some shadows to the white. So the center of the snowman should stay white. Step 4. Blend out the N3 by using the N1, in a flicking motion going towards the white area. Again, we are softening that harsh line that the N3 created. Step 5. Soften the line even more by doing that same flicking motion using N0. Step 6. Color the carrot with YR14. Then, take the E33 and color the ‘knot’ of the scarf, then blend it out with the E30. Step 7. We want to create a snow storm look so I’m coloring the area around the snowman by adding dots. We will be layering a few different colors to get this look, remember to leave white space in between to look like snow. I started by adding N5 dots. Step 8. Add some more dots using N7. Step 9. Add more dots using N3. Step 10. Add more dots using N3, N5, N7, depending on how light or dark you have gone. Step 11. 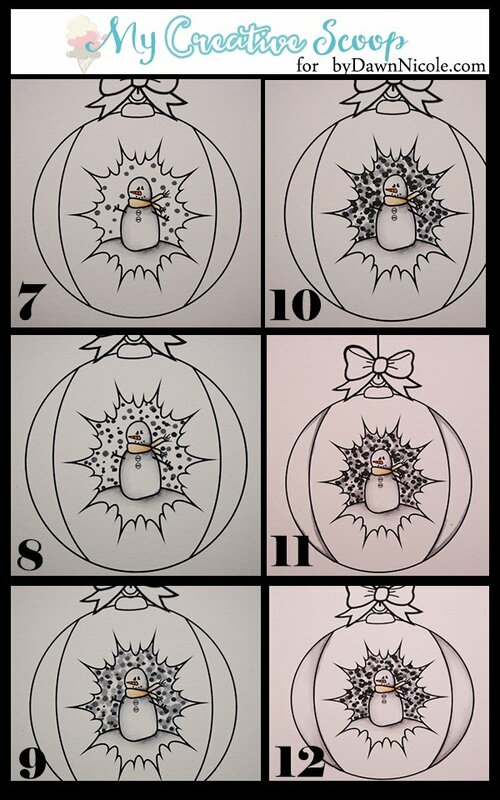 Start the outter part of the ornament by using N3 start at the ‘V’ area (where the 2 lines meet) and trace along the outline tapering off as you move towards the center of the ornament. Do this on each side, top and bottom. Step 12. Blend out that harsh line like we did before with the snowman, using N1 and N0. Then, trace ONLY the ‘V’ area with a tiny bit of N5. Just outline the image. I call this my ‘Make it POP’! Step 13. 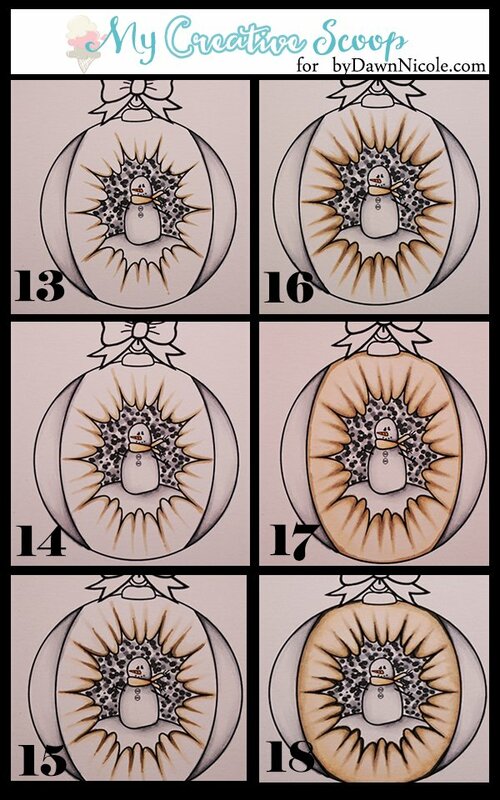 Now start with E43, tracing the scalloped edges of the opening of the ornament. Step 14. Do the same thing with E42, only this time come out a little more. Step 16. Take your E42 again and drag the E44 out. Doing this gradually with the layers of color is deepening those creases and giving your image depth. Step 17. 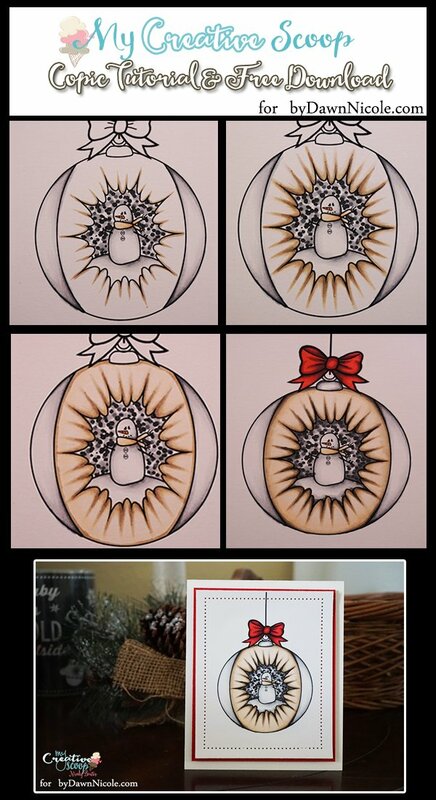 Start at the scalloped edge and fill in the rest of the ornament with the E0000. You do not want to go over and over this, doing that will cause all of your colors to mix and you will loose that depth. 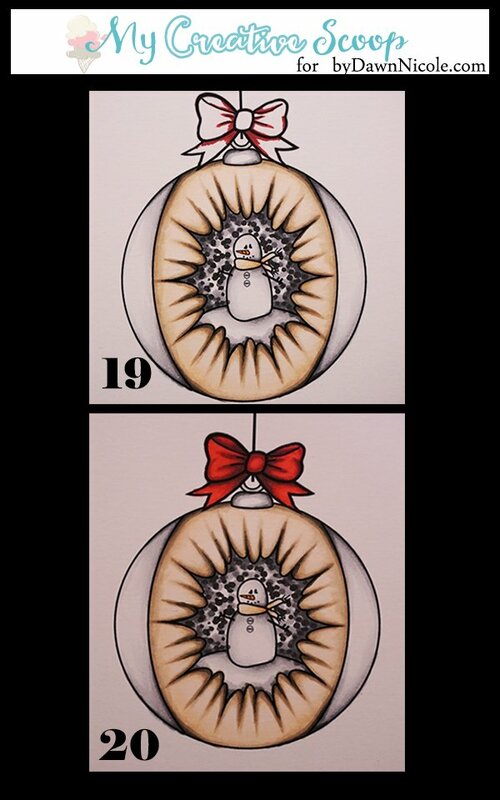 Just one stroke, filling the rest of the ornament. Step 18. Darken just the tips on the scalloped points with W7, for that extra ‘Make it POP’! Step 19. Start with R37 in the areas I have in this photo. Then use R35, coming in a little more, then go back with R39 and again with R37, the R35, until your bow is filled in. Step 20. Add a little N5 to the darker areas for that extra ‘Make it POP’! I also added more N3 and N5 to the snowy area around the snowman but I just wanted to darken the part closest to the scalloped edges. Plus, there’s a FREE download to try out my tutorial. I would LOVE to see your take on creating with it, even if it’s not with Copic Markers! For those of you who’d rather just download the colored image to make your own cards you may do so, I’m also sharing the colored file as well. Download the coloring page version here. If you would like to check out more Copic Tutorials you can check out my blog, My Creative Scoop and Copic 101 guide.